The priorities of protest movements never cease to puzzle me. I've never quite understood, for example, why there is such a ferocious movement against Israel - the only functioning liberal democracy in the middle east; invaded repeatedly by hostile and oppressive dictatorships - while medieval states like Iran and Saudi Arabia get away scot-free with hanging homosexuals, stoning women and bankrolling terrorism. The Free Tibet movement is another curiosity. While no-one more than I would like to see a future in which the Tibetan people are free to rule themselves in a democratic fashion, with free speech and cultural freedom, it seems to me counter-productive to put this before the freedom of the People's Republic as a whole. Because, as we are increasingly seeing on the international stage, the Chinese Communists are not big on compromise. Once the leadership has decided on something, their position is immovable. Any sign of weakness or conciliation would serve to diminish the power of the party and, if there's one thing the Chinese Communist party (CCP) is protective of over all things, it's power. This is, incidentally, why in 1999 they banned a peaceful spiritual movement and have since subjected its practitioners to forced labour, torture and arbitrary imprisonment. The simple fact of the matter is that, with 70 million followers in seven years, Falun Gong had become a potential threat to the party's power and was therefore a 'heretical organisation.' Heresy, one can only assume, against the cult of the State. The idea, then, that the CCP will ever relent to granting Tibetans even the slither of freedom afforded to their fellow Han citizen-slaves is laughable. That this course of action has gained such currency across the world is largely down to the exhaustive work of the Dalai Llama. In seeking to draw attention to his nation's plight, His Holiness was only too aware of the West's image of Tibet as a mystical and harmonious Shangri-la invaded by the harsh and unforgiving Han. It is precisely because the Han Chinese are seen as aggressors in Tibet that people forget how brutally oppressed they also are. This seems to have been the case with the protestors greeting Hu Jintao on his visit to Washington last week. 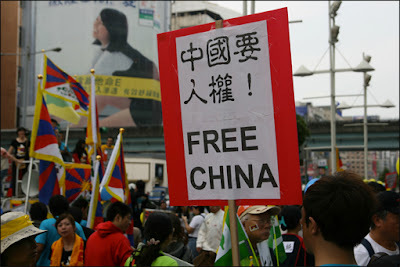 But Tibet will only ever be free when the CCP is toppled in Beijing, as was attempted in 1989, and China is transformed into the liberal and democratic state its people yearn for it to be. The CCP's retort that it is somehow expressing a set of 'Asian values,' different to 'the West,' whereby the wellbeing of the collective is more important than individual human rights can be exposed for the utter nonsense it is with a short trip across the East China Sea. There, what was once known as Free China (before Nixon's cuckold to the mass-murdering Mao Zedong in 1972), is a picture of how mainland China might look today had the Kuomingtang won the Chinese Civil War of 1946-50. Taiwan, it is true, has not always been a democracy. The first free elections of what is officially the Republic of China did not occur until 1987. But, unlike the People's Republic, the government of the day eventually relented to what had become a mass democratic movement. Since then, democracy and liberty have flourished in this nation whose economy, while mainland Chinese were starving, had already become one of the fastest growing and most developed in the world. But the plight of the Tibetans and mainland Chinese should not be the only motivation for the toppling of the CCP. China's rise as a world power is now a fact. This week we saw the People's Republic eclipse Japan as the world's second largest economy at a time when the United States is increasingly seen as being in terminal decline. As Paul Kennedy wrote, the rise and fall of great nations is a relative relationship; new powers rise only as older ones go into relative decline. With China increasingly flexing its muscles in international affairs and exporting hundreds of thousands of 'colonists' to Africa, it may well be they they supplant the United States as the dominant world power. If this is the case, we have to stop and seriously ask ourselves this question; if the Chinese Communists treat their own people in such an appalling fashion, how then will they treat the rest of us? To my mind the biggest disaster to strike humanity since the Second World War was the normalising of relations between the U.S. and the People's Republic. The moral implications of dealing with the largest totalitarian state in history aside, the economic ramifications have been profound. It's not something we can turn the clock back on. I completely agree. And, as they say, only Nixon! It's yet another example of how damaging the cold war policy of 'the enemy of my enemy is my friend' has been. Like the Mujahideen in Afghanistan, America's chickens have most definitely come home to roost.